CapitaGreen has been nominated as “Finalist in World Green Building Council Asia Pacific Leadership Awards in Green Building 2016”. 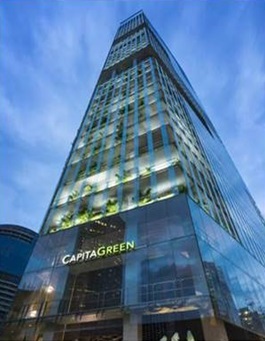 CapitaGreen is also a Winner in the SGBC-BCA Sustainability Leadership Awards 2016 and also represented Singapore in the WorldGBC Awards. Quantum Automation is proud to be associated with CapitaGreen, whereby we contribute to substantial engineering work involving our BMS System to achieve the energy optimization for the chillers’ plant system to comply to the Greenmark Platinum criteria.